This load was developed for SBRs like the LWRC PSD and UCIW. 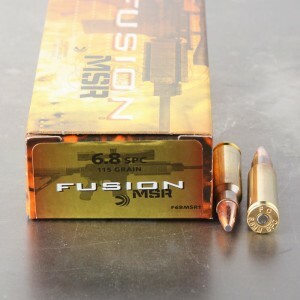 It has low flash, light recoil and is still deadly at 250M even from an 8.5" barrel. After several years of failure to stop situations with suicide bombers and assassins the king of Saudi Arabia armed his royal guard with 6.8SPC SBRs loaded with XM68GD based on US research data. They're used to take down terrorists and assassins on an almost daily basis with no more FTS problems. If you want "Hog Ammo" maybe this won't be your cup of tea but if you use 6.8SPC for self defense this is the right stuff. Great ammo should have gotten more at the price I paid. Went back up after my purchase. good factory ammo at a good price. Excellent ammo. Loaded righted up the power scale, and with a very effective bullet, terminally speaking. Makes very good hunting ammo, as well as for home defense or SHTF bug out use. That's why it's so hard to find now, and when found goes for a good bit. Got mine on a Black Friday sale, so wasn't as expensive. My only issue is the Federal brass casing. Federal isn't known for the most durable cases, and if you reload, don't red line these cases, or the primer pockets will loosen up quickly. Other than that, top rate ammo. Hope the Middle Eastern countries write another contract for more ammo.